History was made for two teams that celebrated a championship Friday at the 2018 All-Island Cross Country Meet held at JFK in Upper Tumon. 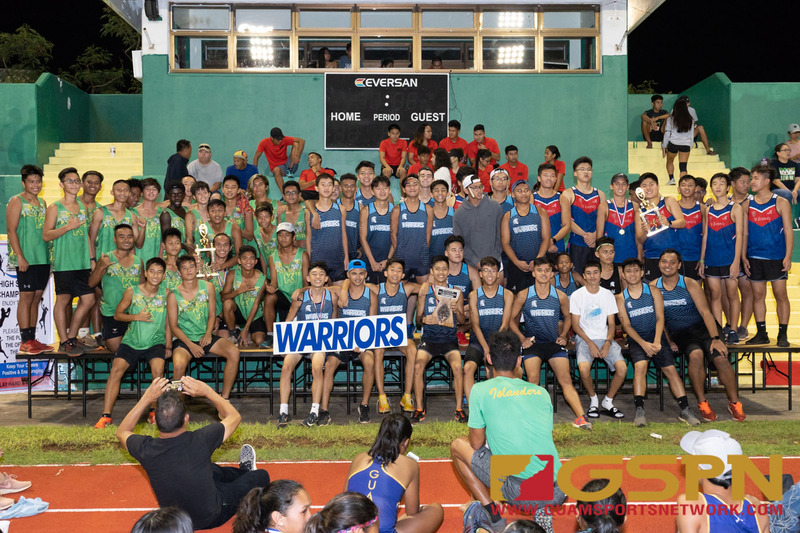 The St. Paul Warriors, under head coach Sherwin Paet, made history and won their first ever IIAAG championship with the boys team winning the title. The St. John’s Knights won the girls championship with only six runners racing in the meet, winning their first title in 20 years (97-98). The Knights celebrate the title under new head coach Desmond Mandell III, his first cross country title as a head coach. The Knight’s Jenna Han won first overall in the girls division with a time of 21:46. Han stayed at the front of the pack to start the race and pulled away after the jungle portion of the course for the victory. This is Han’s second All-Island title, winning the race as a freshman. “It’s been an unbelievable experience, the team has worked so hard to become one of the top teams,” said Han. “Our coaches (Desmond Mandell III and Derek Mandell) helped us learn about hard work and dedication. They also prepared us to come into meets with the right mentality,” said Han. “This is actually the first cross county championship I have won as a coach, so I couldn’t be more proud of my team. And for our boys to secure third (only one point away from 2nd place) was extraordinary. I am very excited to share this moment with these kids,” said Mandell III. Acquiring valuable points for the Knights was fourth place finisher Madison Packbier (22:34), ninth place finisher Kailea Wiese (23:35), 18th place finisher Janalyn Criss (24:41) and 21st place finisher Jenny Mann (25:16). The Knights finished with 49 points, followed by the JFK Islanders with 72 points and the Academy Cougars rounding out the top three with 86 points. Taneea Henderson from Guam High finished second overall with a time of 22:16. Henderson is a freshman basketball phenom and joined cross country to prepare herself for the upcoming season. “I really didn’t expect to come in second place. I learned so much from Coach Joe Taitano this season especially pacing myself and keeping my composure during the races,” said Henderson. The Panthers were also defending champions last year and finish in fourth place for the team event with 93 points. JFK’s Mya Tolerson (22:27) and Chasity Minor (22:37) finished third and fifth place, respectively, to help the Islanders win 2nd place. The Academy Cougars were ecstatic to make the top three in the overall team event. The Cougars were led by Annika Almario with a time of 23:15 and a fifth place overall placement. Brandon Miranda finished the season undefeated, winning the boys race with a time of 17:54 to take the first overall honors. Not too far behind him, was his first cousin Jacob Miranda finishing fourth with a time of 18:15. The Mirandas 1-4 finish was huge for the Warriors who ended up winning the title with 72 points. “First of all, I give all glory and honor to God; I’ve trained for this for four months now. I never let up during my training and put all trust in my coach, my family and school,” said Brandon Miranda. The Warrior top five finished 1st, 4th, 12th, 22nd, and 33rd for a grand total of 72 points, JFK finished second with 82 points barely edging out St. John’s with 83 points. Paet’s St. Paul squad is destined to repeat next year with four of their top five players listed as underclassmen. Jacob Miranda is a freshman, Kanta Yamazaki (12th) and Masato Tsuji (22nd) are also freshman. Keith Nauta (33rd) capped the top five from St. Paul’s is a sophomore. “We couldn’t have done any of this without the guidance of our coach (Paet), he deserves much of the credit for our success this season,” added Brandon Miranda. The Miranda family was proud of their boys and their contribution to the Warrior squad. Brandon, a junior, was especially proud of his younger primo. “Im like a big brother to Jacob and I’m so proud of him and his performance. He pushes me to do better and I see him as being the next phenom,” said Brandon Miranda. Nick Keefe from the defending boys champion Guam High Panthers finished second overall with a time of 18:00. “My competitive mindset will not be satisfied with nothing less than a first-place finish but I’m still proud of the performance and my team. We came a long way from being undefeated last season and only winning two Meets this year,” said Keefe. Okkodo’s Kyle Delos Santos finished third with a time of 18:12, Marc Rajesh from St. John’s was fifth with a time of 18:24. The Knights boy’s team almost pulled off a huge upset and settled for third place by one point. Running doesn’t stop this week, the Asian Pacific Invitational will take place next week. The two event featuring the top cross country schools in the region will take place on October 19-20.